The T-80. Notice how it drives above the ground. (A la Grand Theft Auto Vice City). For those without comedic tastes, the "questionable parody" of this website called Wikipedia have an article about T-80. The T-80 is a third-generation main battle tank (MBT) designed and manufactured in the Soviet Union, and a common, rusting landmark in Afghanistan. Dissatisfied with continued confusion between the T-72 and T-55, Soviet field marshal Pyotr Koshevoy requested a new design be developed for deployment in East Germany, as "...The West Germans keep laughing at our post-war tanks. It really hurts the crew's feelings." Koshevoy suggested a redesign of the T-64, declaring, "That's one we could try." So they did. The first T-80 rolled off the production line in 1976, four years earlier than expected. Officially designated as the T-80A, it was promptly sent to East Berlin, where General Secretary Erich Honeker immediately tooted its horn. For five years it served to distract the West Germans as Soviet manufacturing plants worked to improve the design, releasing the T-80Bee in '81. Featuring alternating black-and-yellow stripes across the entire frame, it was extremely popular with the pot-smoking hippies of Amerika. Unfortunately, this camouflage scheme only worked well in warm climates or valleys full of flowers, and so the design was soon replaced by the T-80BV, featuring better armour and more cup holders. The T-80C through T-80T were never produced; nevertheless, KGB agents leaked documents to deceive Western spies and create the illusion that a new design was being released every day. Whether or not the West believed this is unknown, although in the Soviet Union General Secretary Konstantin Chernenko received a number of telephone calls from President Reagan asking, "Is it true?" McDonald's even released a series of T-80-themed toys in its Happy Meals, much to the joy of children all over the world. The T-80U was the next development, improving everything about the tank except its mileage. Featuring a 930 kill-a-watt engine, it was a vast improvement over previous propulsion systems, reaching a maximum speed of 70km/h, 40km/h faster than most State-built cars of the time. 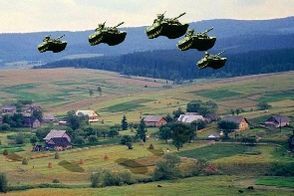 A group of T-80s manoeuvering in hilly terrain has occasionally been mistaken for the Soviet Galactic Battle Fleet. When Mikhail Gorbachev was elected General Secretary of the Soviet Union, he relocated T-80 production to Ukraine as part of his policies of glasnost and perestroika, explaining, "Our neighbours want to play, too." The move turned beneficial rapidly: Ukrainian mechanics continued to perfect the tank in three successive models, boosting firepower, lowering cost, and engineering the wheels to give the most menacing squeak. One of these models, the T-80UK was so popular with Britain that the Soviets temporarily broke tradition and exported nearly 20 tanks, now on display in museums. However, Gorbachev's radical move, along with most of his other reforms, caused the power-hungry Politburo much concern. After the collapse of the Soviet Union, Russia stopped importing Ukrainian-made tanks and went back to building its own, although it took eight years before the KGB FSB had stolen acquired enough technical blueprints to produce a new version. Currently, the T-80 is most commonly employed by the Russian Federation. Ukraine continues to adapt its models, designated under the group name 'T-84'. Not to be outdone, Russia has released the T-80 PRO limited edition under the name 'Black Eagle'. Already 28 of these models have been sold to Korea and Red Alert 2 enthusiasts, who mistook them for jet aircraft. The chassis of the T-80 keeps a very low profile like the T-64, and despises its T-55 cousin for being as nearly as prominent a target as the American M-60 Patton. 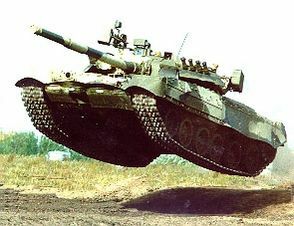 Following the old Soviet philosophy of "Less is More", the T-80 is half to three-quarters the size of the M1 Abrams, while affording more cabin room (and so, more drinks) than any other Russian battle tank. 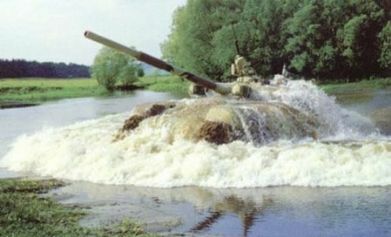 It has often been described as the most manoeuverable tank on the planet, earning the nickname of the 'Flying Tank'. This compensates for the fact that engineers still cannot build the T-80 flat enough to pass under tollbooth gates. Little-known fact: T-84s also serve as Ukraine's submarine fleet. The T-80 is equipped with a 125mm 2A46 smoothbore main gun, 7.62mm PKT coaxial machine gun, and 12.7mm NKVD political-repression machine gun (an anti-aircraft gun for non-Russian models). It is usually propelled by a gas turbine engine. Ukrainian models also run on diesel, and a perogie-based fuel system is currently in development.